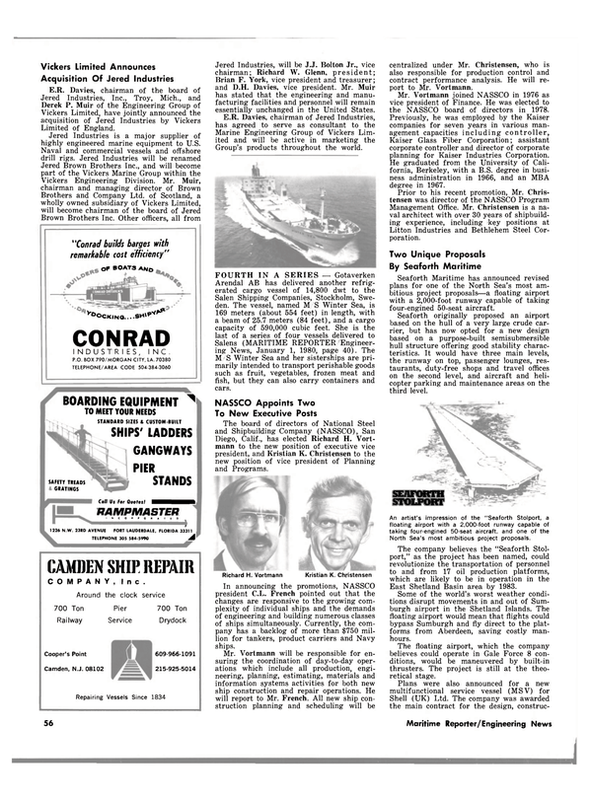 At the San Diego Section of The Society of Naval Architects and Marine Engineers meeting held in January 1980, Ralph J.
Bradford, chief marine engineer from National Steel and Shipbuilding Company, presented an interesting paper entitled "LHA Rampwell Design, a Successful Failure." The paper described a unique landing craft handling concept that was developed and successfully tested —• full scale — during the LHA contract definition competition in the spring of 1968. The concept was applied to an unsolicited proposal for conversion of the LSD 37, 38, 39 and 40. It would have resulted in a significant increase in cargo and troop capacity from conversion of existing ballast tanks to troop and cargo spaces. Although the fullscale test was a success, the Navy rejected the concept. However, the author concluded with the belief that the concept is still viable for implementation on existing LSD and LPD vessels. Sixty members and guests in attendance concluded the meeting with a question and discussion period.